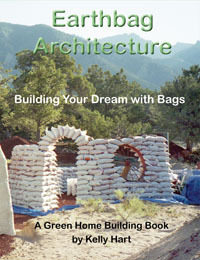 Q: Do you need to be an expert to build a house with earthbags? A: No, not really. You can build with earthbags with just a bit of knowledge, although it is good to start with small projects to gain experience before taking on larger projects. Q: How long do earthbag buildings usually take to construct? A: The time to build this way depends on many factors, obviously...the size and experience of the work force, the availability of appropriate fill material, and the complexity of the project. Q: Can you give me an idea about the labor on vertical walls (e.g., maybe an approximation of a certain length of wall, say 9' high per person...)? A: Building with earthbags can go surprisingly quickly. Here is an example: I just facilitated a workshop on various aspects of sustainability for an international conference held in my home town. My particular portion of this was to coordinate about a dozen people at a time building a sort of earthbag gazebo and amphitheater. We were filling the bags with the local sandy soil dug right on the site. We only worked about 3 hours each day for a total of five days, which works out to about 180 person-hours to complete the building of the walls. The total surface area was about 700 square feet...so one person at this rate could create about 4 square feet. Of course these were complete novices at the process and they were also clearing the land, digging and transporting the soil, and doing a lot of standing around and talking. This rate could easily be doubled or tripled under different circumstances. When I was building my house, I used to lay 2 or 3 courses around a perimeter of about 75 feet in one day. This works out to about 14 square feet per hour. I was filling the bags from a nearby pile of scoria (crushed volcanic rock). I hope this gives you some idea of how fast it might go. Q: I'm looking into earthbags myself. How hard is the labor compared to strawbale? A: As far as the labor of building with earthbags compared to strawbales goes, I imagine that a strawbale wall would go up faster, but then you are stuck with using other materials to make the roof. With earthbags, you have the flexibility of being able to create curved forms, including the roof, if you want. Both systems require an exterior and interior plaster, which would probably take about the same amount of labor. Straw bales are quite heavy, and must be lifted into place. Earthbags can be filled in place, so the lifting can be minimal. Also, if the bags are filled with crushed volcanic rock, as I did, then they are relatively light (about 35 lbs) and can be lifted easily. Q: I want to build with earth. Earthbag construction seems to be the simplest way. Should I have the earth I am going to use excavated now (putting a pond where the earth was) or dig it out as I use it. What is faster and more efficient? A: This probably depends on several factors. The closer the soil is to the project, the easier and faster it should go. Soil is heavy stuff, so the less you have to lift and move it the better. In fact, as the walls go higher it is often easier to carry buckets of soil to fill the bags in place, rather than heft them up from the ground, especially if you are working alone. So it might be easier to excavate the soil first and have it dumped nearby. Also some soils are difficult to dig, so having a machine do some of this work could save your back. Q: Is it better to use a single long tube method of construction (Nader Khalili) or single bag at a time. Which would be faster for one person to do? A: I am not much of a fan of the long tubes. I find them a nuisance to fill, they can only be filled in place, and they have a tendency to roll. Especially with one person, I would recommend using the individual bags. Q: I saw your (excellent) pictorial on the Riceland dome. I live in Central Gulf Coast Florida- subtropical -and want to build an earthbag studio, as simply as possible. Wondering how long it took to erect the Riceland and how many people participating. A: My wife and I basically completed the Riceland project to the point pictured in that description during one summer. We had a little help from friends, but mostly it was me, with my wife helping occasionally. Q: I get the idea that using individual traditional sized sandbags is cheaper than buying the long continuous bag material from Cal Earth, or trying to get a manufacturer to produce the same product. Seems to me that if the material cost is less, the labor involved would be greater, thereby perhaps offsetting the benefit if you are hiring the labor? A: Well, it all depends...yes the long tubular bagging does seem to be more expensive, although it really shouldn't be, since it is basically the raw material that is eventually made into bags. I think that CalEarth has had a very nice business of selling the tubing at a considerable profit. Individual bags can be filled and handled by a single person (as I did with most of the house that I built). The tubing really needs a team to handle the various aspects of getting the bagging filled and laid on the wall. So it is hard to compare labor-wise. Would you suggest using the long continuous bags, or the short ones, if you were approaching this subject in relationship to building up a small team that could go into business building these structures? There are advantages to each approach. A well-practiced team could build rather efficiently in either way I think. The logistics of continuously filling tubing is potentially awkward, but possible. I suspect that there is a slight advantage with the tubing in terms of eventual strength of the wall to resist seismic events, but this has not been proven. I heard it mentioned in some of the Cal Earth material that the process could be mechanized. Sure, there are various portable conveyors that could be employed to elevate and feed material into tubing, but this would require some very coordinated movements to keep the process rolling. With indivual bags, you can use automatic bag filling machines, as described at http://earthbagbuilding.com/articles/bagmachine.htm . I assume this means using a concrete pump to fill the long continuous bags. Again, have you had any experience using a concrete pump to fill the bags? Do you think this is worth doing assuming that one had the concrete pump in hand? It also seems that some type of stucco gun would be desirous if one wanted to cut down on the labor and speed the process up of putting the finished material on the interior and exterior of the walls. What do you think of using a stucco gun? There is one particular type of stucco sprayer that will spray practically anything that is put in the hopper, including earthen plaster and lime plaster: TirolessaUSA Stucco Sprayer (available from Amazon.com). Q: My director's husband decided not to build with earthbags. He couldn't get workers at a price he was happy with. I think Thais perceive earthbag building as too labor intensive. It is more work than the way they build. A: There is a general perception that earthbag building is labor intensive, and I suppose it is, but mainly because earth is heavy. If the bags are filled in manageable buckets and you have a crew, it is not so bad I think. Construction is hard work no matter how you go about it. Q: I'm curious how you managed to get so far with the earthbag home you did in Colorado. I'm 33 now and it wore me out. I would not recommend earthbags for anyone over 25 yrs old or who has less than 5 people to help them all the time. A: Well for one thing I was filling my bags with crushed lightweight volcanic stone (scoria), so the bags only weighed about 35 lbs when full. I could carry full bags up a ladder quite easily. I was in my fifties when I started my bag project, and would gladly accept help on the construction when people offered. I am convinced that there is no really easy building method however...it all takes considerable work. Q: I am a single woman. I know something like this would involve a lot of labor, but I am of the belief that if I pace myself I can do anything. I'm wondering if I wanted to do something like this how easy it would be for me to do it slowly, to pay as I go? I am really quite interested in this but have mixed feelings on how doable this would be for me. A: It always helps to have some assistance on building projects, but a lot can be done by one person. I built a fairly large earthbag home in about 3 years, working mostly by myself. As long as you keep the bags covered to keep the sun off of them, you can go as slowly as you like. The skill involved is really not great, and you can learn most of by following instructions on this website and practicing. You can fill the bags in place, so you don't necessary have to carry a lot of weight at a time. Q: How fast or how many linear feet of bags in a straight row can a team of 3 do in an 8 hour day given the people are experienced with one person prepping soil mix, one filling buckets, and one filling and laying the bags; the soil preper would also be tamping once one run is done? A: You might calculate that a team of 3 persons who were well coordinated should be able to create perhaps 300 square feet of wall in one 8-hour day. That is quite a bit of wall area I think, but it doesn't include the plastering and finishing. Q: Ideally how many people is recommended to build an Earthbag building? And how long would the take to build? A: A single determined person can do it, but more help will get the job done faster. The time all depends on the size of the project, the skill of the workers, and the size of the crew. Anywhere from one month to several years would be a range. (Owen) Three or four workers are best in my opinion. You could use more or less. The duration all depends on skill and strength and how hard you work. Weather is also a factor. Build something small and then you'll have a better idea of what's involved at little or no risk. Q: You mentioned that you personally filled and set 100 bags per day. How do I put that into perspective as far as my own build? A: I was using light weight scoria to fill my bags, so that I could fill them on the ground and easily carry them to the wall I was building. Of course, you have to lay the barbed wire first, and that takes time as well, and then the bags need to be tamped into place. Speed increases with experience, and with more people the tasks can be divided...so there are a lot of variables around how much wall can be built in a day. Q: Which aspects of the building need an experienced builder? I just need to get an idea of whether or not my husband and I can do this (with some additional help), or not. I had read on some blogs that it's very easy to build using the Earthbag method, and that is a big part of what did attract me. If we need a carpenter and electrician/plumber, that we can get...but are any other skilled builders needed? A: In a monsoon climate you will need a good roof to shed the rain away from the house. So besides the earthbag walls (which require relatively unskilled labor to construct) you will need carpenters for the roof, doors and windows, etc. and plumbers and electricians to complete the house. Various flooring possibilities dictate what expertise would be needed there. If you were to make the walls entirely with bags of rice hulls, they could only be used as infill within a solid framework of wood, metal or concrete that would also need to be built. There is a lot of information available about the process building with earthbags free on this websites, as well as some books and videos you can purchase. But there is a learning curve about this.